Earlier this year we were thrilled to be approached by Charlotte Garratt, the fabulous bridal designer, to feature our jewels in a photo shoot she was organising with Emma Gutteridge of Emma Lucy Photography, a very talented photographer based in Brighton. 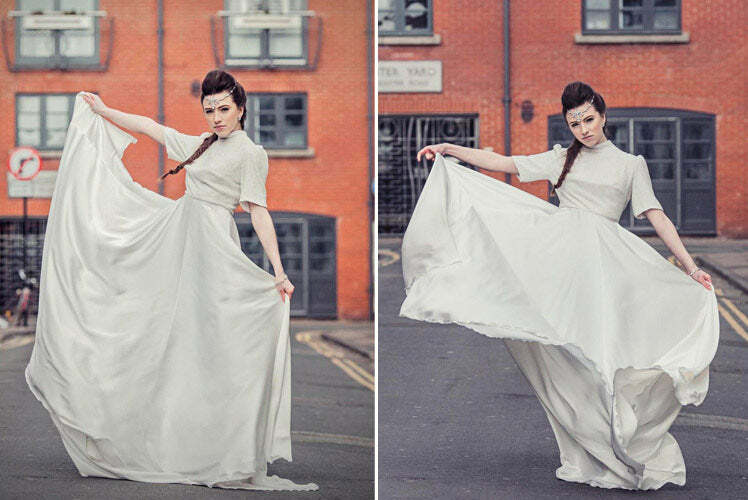 Charlotte had the vision of a bridal fashion shoot in Brighton with an urban base and, we are sure you will agree, the results are fabulous. We asked Charlotte to enlighten us a little on her inspiration for dress designs, the photo shoot and also about iconic brides. What first inspired you to become a bespoke dress designer? Ever since I was little I have always been drawn to fashion and dresses! My Grandmother made wedding dresses and was always creating outfits for me as a child. Once I created my first corset I knew I wanted to go into bridal wear, it just seemed a perfect fit! 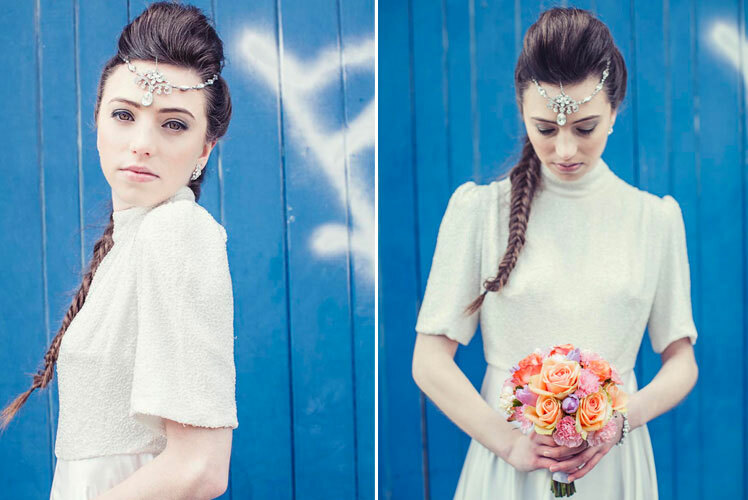 What was your original inspiration for the “Bridal Fashion in Brighton” shoot? We wanted to create looks that brides could easily transfer into their own weddings days, fashionable on trend looks with key pieces that brides could re-create. Why Brighton? How did you choose the specific location? Emma Lucy, our fabulous photographer, is based in Brighton and so knows the area very well. 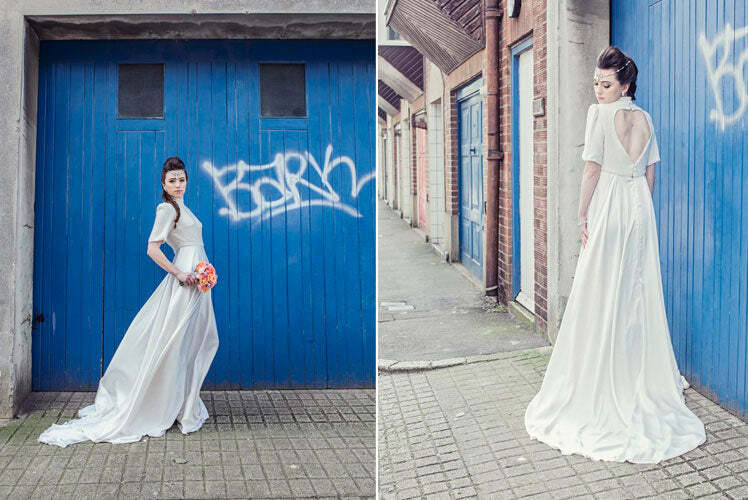 We wanted an urban, edgy backdrop, which fits Brighton perfectly and she knew all the perfect spots! Did you enjoy working with Emma Lucy Photography? I’ve worked with Emma on a number of occasions and every time has been great fun and very successful, we work well together and she’s a lovely, extremely talented photographer. Do you have a favourite era of bridal fashion? My style of designs are typically quite modern and chic, but I’m always looking to the past for inspiration, in particular historical corsetry and the Victorian era. It always amazes me how fantastic and detailed the gowns were and mostly hand sewn! Who, for you, has been the most iconic bride? Obviously of recent times Kate would be the most iconic bride. Lace is still very popular, which is great because there are so many different types of lace that designers are able to explore and create stunning new designs each unique to the lace used. What one piece of advice would you give to a future bride when choosing her gown? Shop around, keep an open mind, and take notes! Dress shopping can be quite an overwhelming experience, take it slow and don’t stress too much! If you can’t find something that’s perfect in stores, having something designed just for you is a great option.